Health and resilience in the presence of parasites, kidding percentage and survival of kids, and growth rate all are benefited by proactive inputs of trace elements and vitamins. 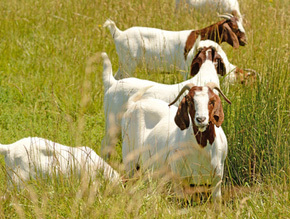 ROBUST lick was designed specifically for goats and is available in loose granular and block formats. The granular format is best suited for late pregnancy supplementation and for kids and hoggets. The blocks provide a maintenance plus input for dry stock and suit more extensive applications. FROLIC is ideally given twice pre-mating; 2-4 weeks prior to mating then again at the start of mating. Where this is not possible then one drench still supplies the full quota of iodine. Note that you can spray FROLIC on pasture and confine does on this to eat it [spread treatment over say 3-4 days, allow for some sprayed to waste]. It is available as a liquid or soluble powder. If you are contemplating injectable iodine call us to discuss the most optimal time to do this in combination with oral iodine so as to get the best overall benefit. SURE-n-SOUND was developed to supply a boost of nutrients to enhance immune function, for the health and healing of nerve tissue, cartilage and skin (including that between the hooves, and the hoof itself) and also the integrity and functioning of the mucous membranes (lungs, eyes, gut). Issues include scald, pleurisy, pink-eye, scabby mouth. Ideally it should be used primarily as a preventative nutritional measure - warm wet or dry dusty conditions, seed heads and or thistles. Weaning is undoubtedly a stressful time which increases the requirement for nutrients, especially vitamins, yet the supply from the rumen is typically reduced. Changing diets, especially when it is onto brassica crops, can give rumen microbes a setback – it takes time for them to transition and often vitamin production is impaired during this time. The design of QUICKSHIFT aims to cover for this interruption, ensure energy metabolism is unaffected, stimulate rumen microbes and ensure appetite is maintained. It is given as a drench or added to feed at weaning or at the time of a feed change and repeated ten days to two weeks later. Targeted at lesser kids in the first instance, THRIFT-n-CLEAN is often used between worm drenches where kids are doing OK and the FEC results are below trigger point, thus extending the worm drench interval. The minerals in THRIFT-n-CLEAN may trigger oesophageal groove closure in some animals thus diverting the drench squirt passed the rumen, and this can reduce the effectiveness of worm drench. So drench separately from worm drench or drench with THRIFT-n-CLEAN on the way in, emptying kids overnight and worm drenching before turning them out. For best results add VINEGARL (double strength ACV medicated with standardised garlic extract) when making up the solution and where required SELENIUM can also be added as it is made up. COBALTISE PLUS is a mineral combination for spraying onto pasture (or summer greenfeed). It combines cobalt, iodine, zinc, chromium, sodium, boron, copper (optional). SELENIUM can be added. This combination is designed to benefit growing stock but also clover growth.